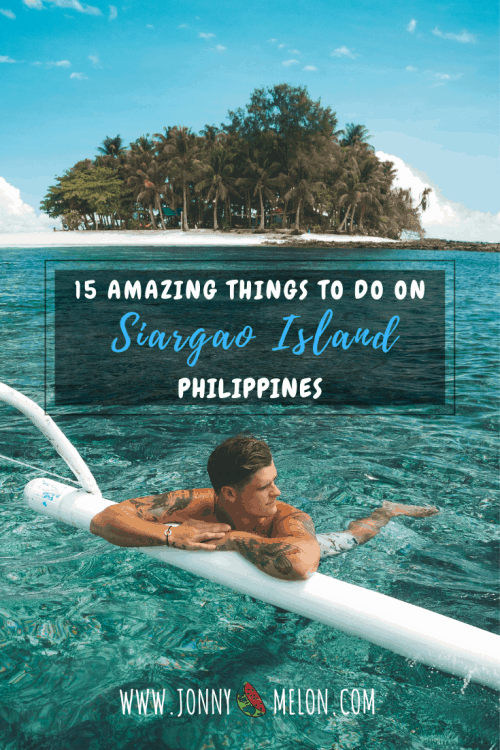 I spent 2-weeks exploring this island located in South Philippines and I have put together The Ultimate Siargao Travel Guide mapping out all the must-see spots to add to your Siargao Itinerary. When I arrived in General Luna Siargao, the first thing on my list of things to do in Siargao was to head straight to the Cloud 9 boardwalk to watch the sunset. 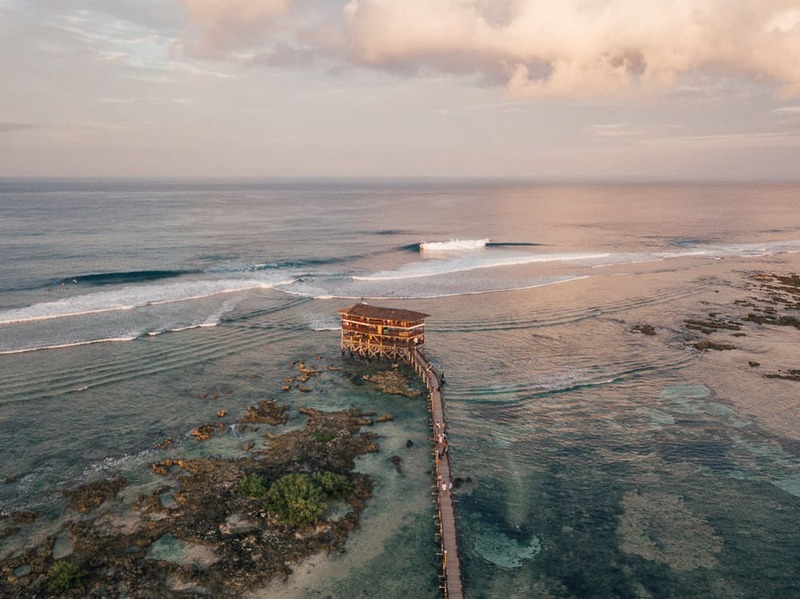 A long wooden pier stretches out across the reef which ends at a 3-story viewing platform that overlooks the Cloud 9 wave, a popular Siargao tourist spot. 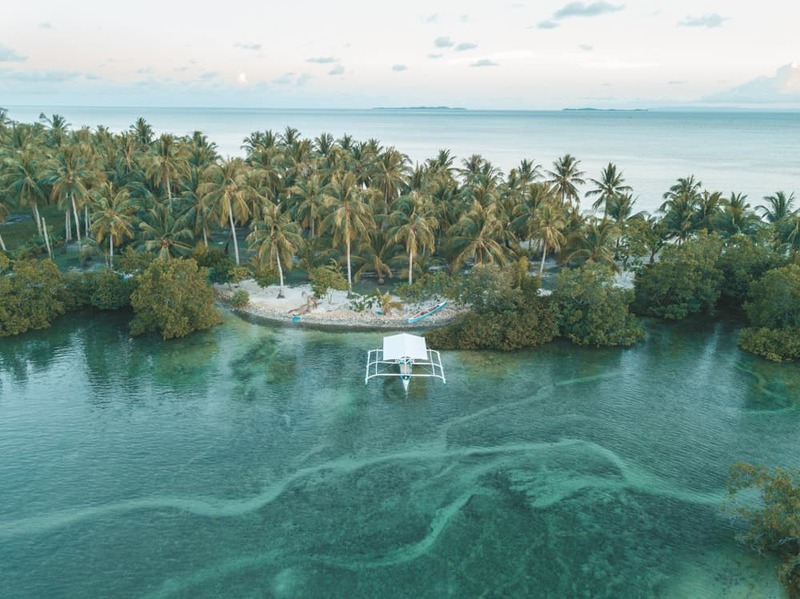 Click Here to see the full blog post of Cloud 9 Siargao. 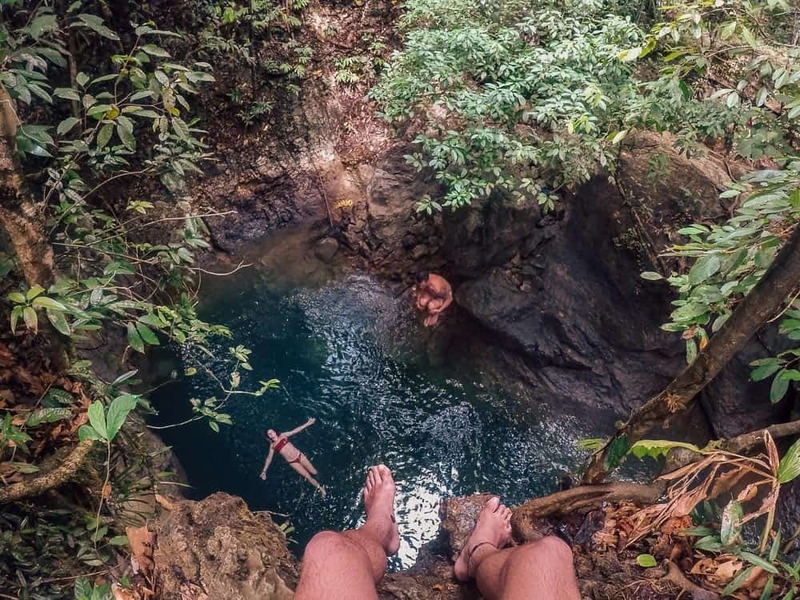 Note, if you are planning to do some cliff jumping at Magpupungko take a pair of reef shoes or old shoes to climb up on to the rock formations as they are very sharp and jagged. 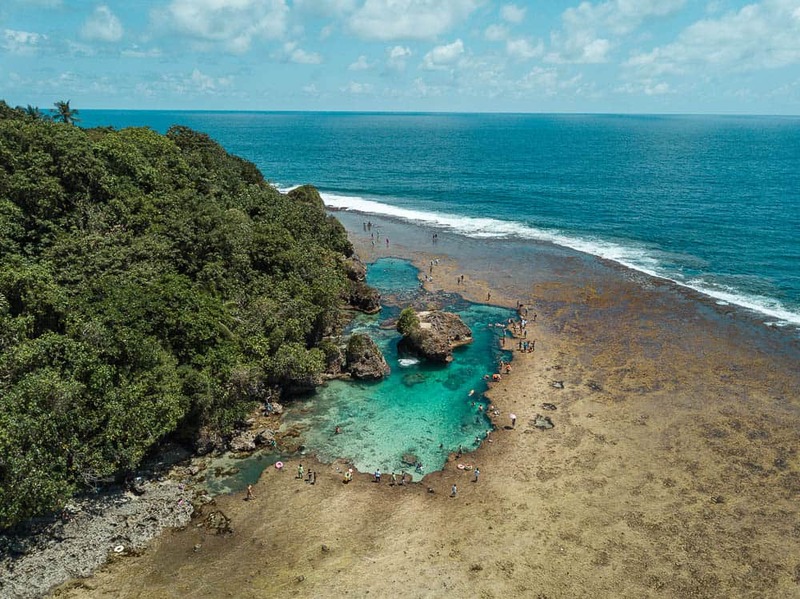 The water in the Magpupungko Rock Pools is up to three meters deep so you won’t have to worry about hitting the bottom when rock jumping. 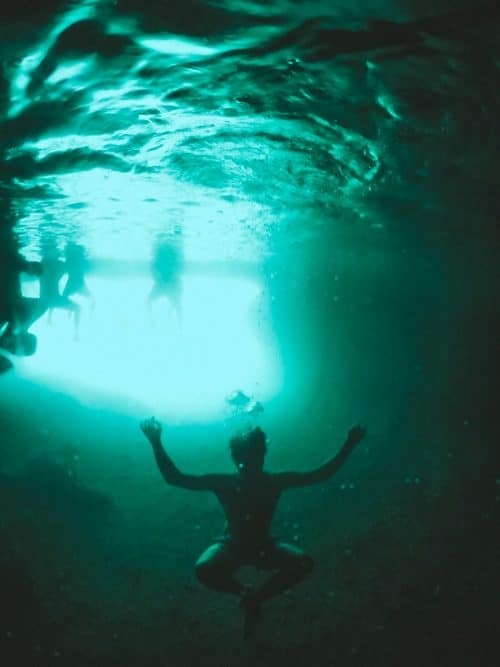 Tayangban Cave Pool is one of the best inland experiences I had during my visit to Siargao Philippines. 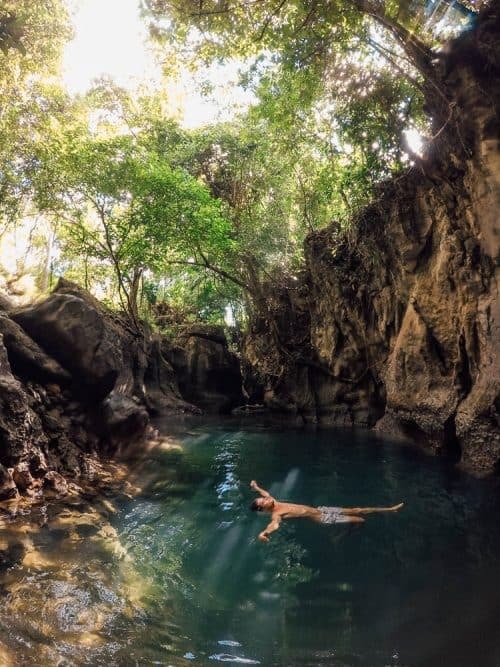 Be sure to add Tayangban Cave Pools to your Siargao Itinerary and discover the unique twin cenotes, bat caves and emerald rock pools on a canyoneering adventure at Tayangban Cave. 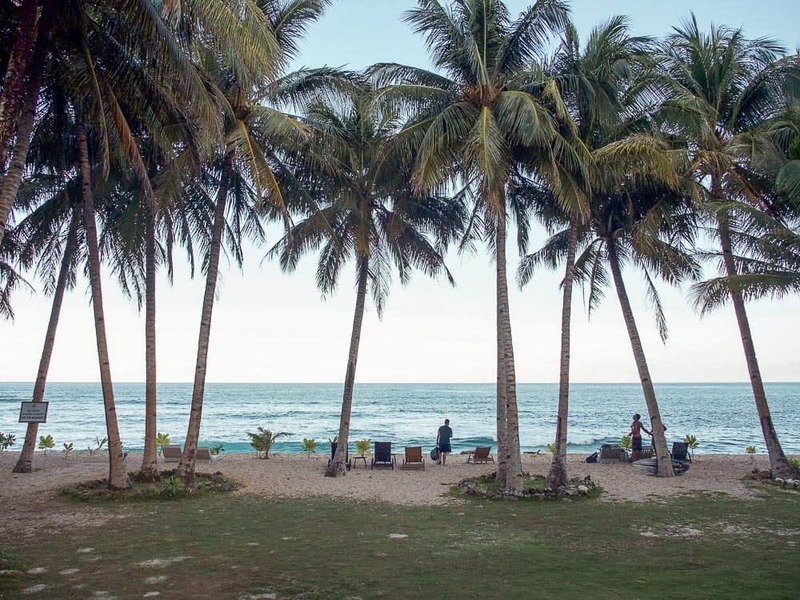 The bent palm tree in Siargao has gone viral on Instagram since it was discovered in 2017. 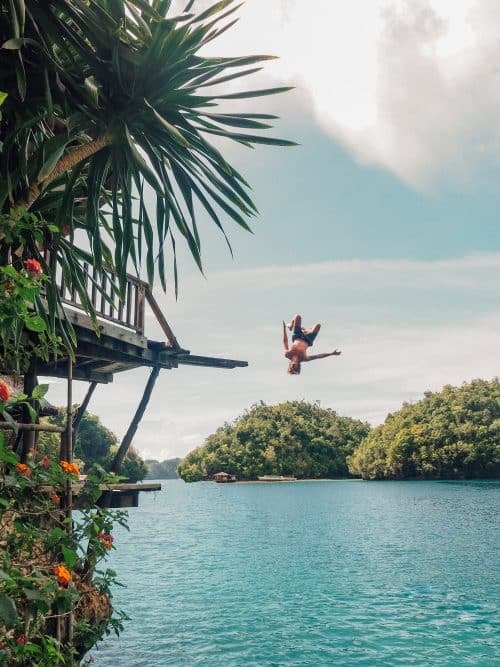 If you are looking for the ultimate adventure, be sure not to add this epic palm tree rope swing to your list of things to do in Siargao. 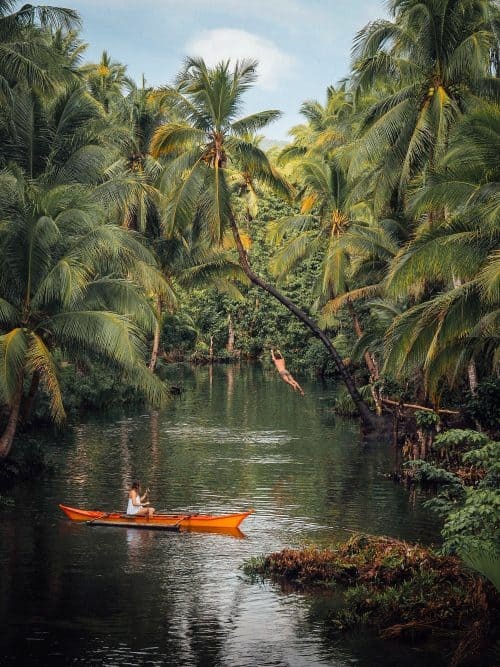 The river beneath the bent palm tree in Siargao is around two meters deep so it’s safe enough to swing and jump without having to worry about hitting the bottom. 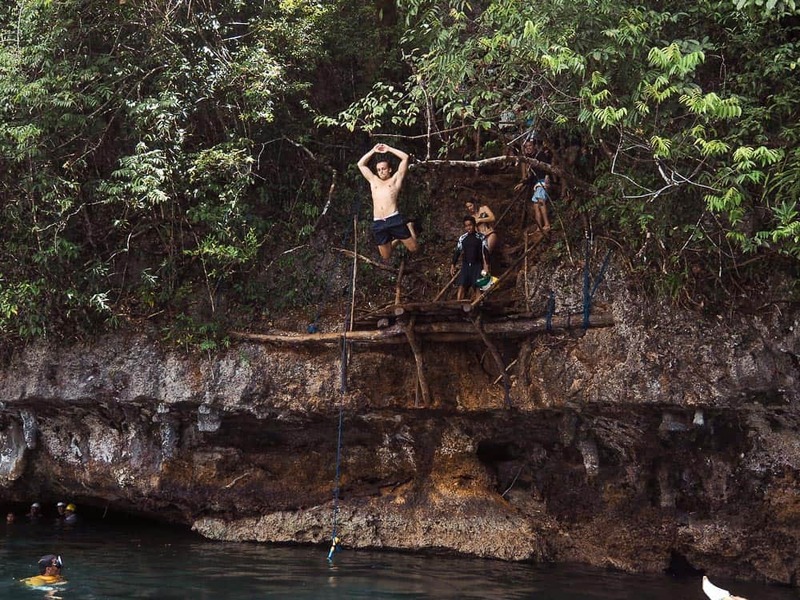 A group of local kids were showing off their backflips and excited to play with us on the palm tree rope swing in Siargao, which is their everyday playground. 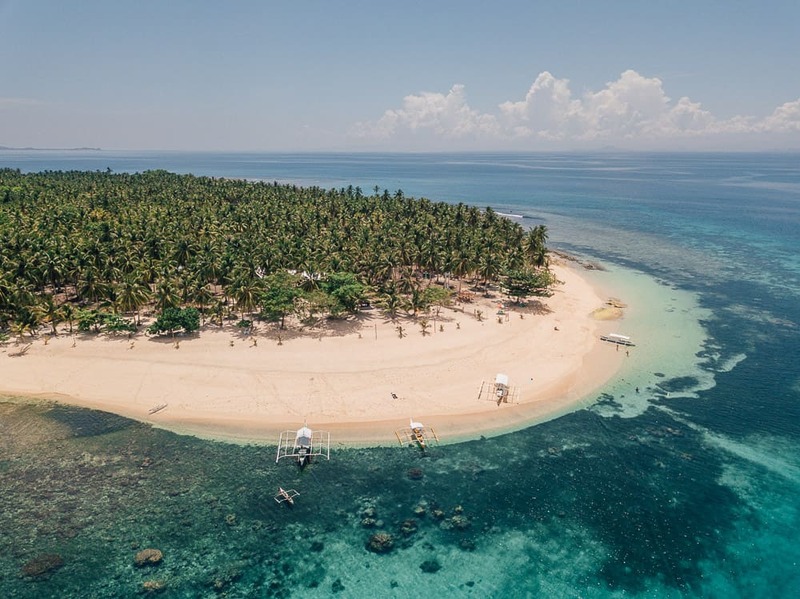 Daku island is the next stop on the Island Hopping Siargao itinerary, just a short 20-minute boat ride from Naked Island. Our captain beached the boat on the sandbar at Daku Island and my friends and I were quickly off on foot to explore. 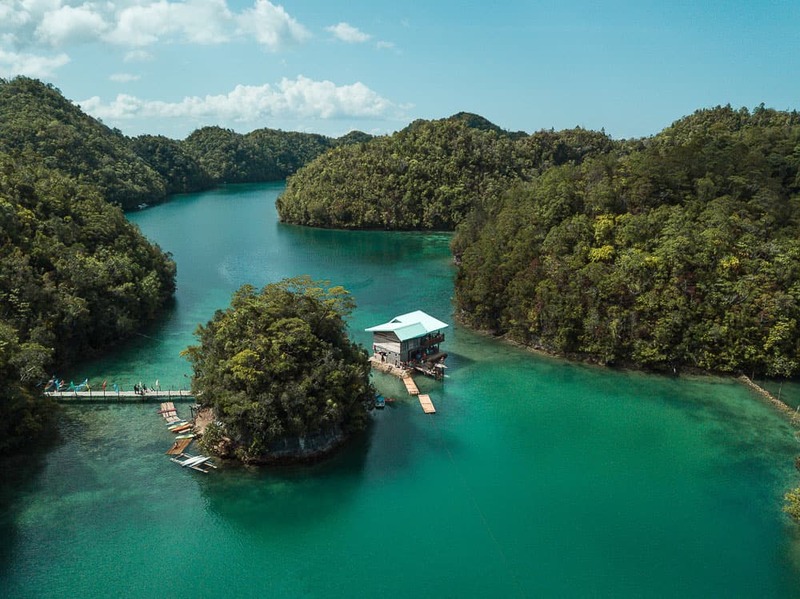 There is a 100 peso entrance fee per boat when arriving at Daku Island and the man in charge of collecting monies will be sure to make himself known to you upon arrival. 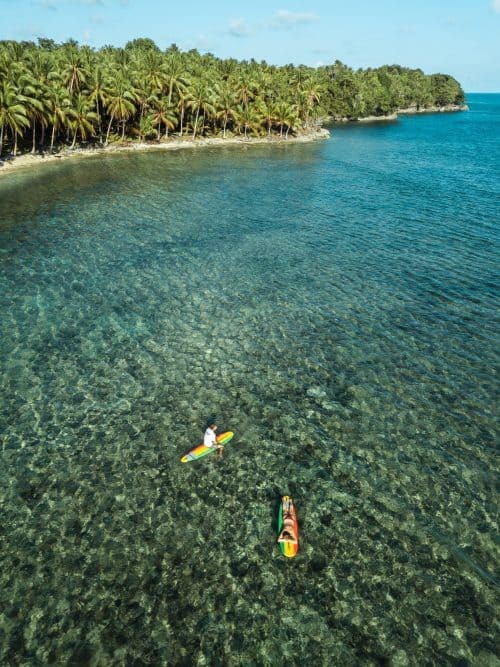 The last stop on the Siargao Island Hopping tour is Guyam Island. When I think of the words ‘tropical island’ and ‘paradise’, Guyam Island is a perfect example of that. 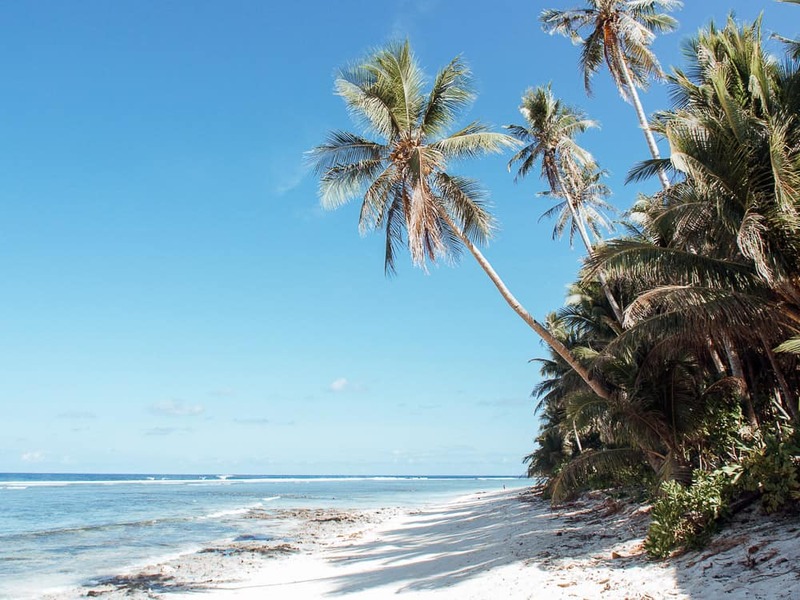 This tiny little island in the middle of the ocean is covered in a miniature coconut palm tree forest and surrounded by glistening white sand and a shallow, rocky reef. 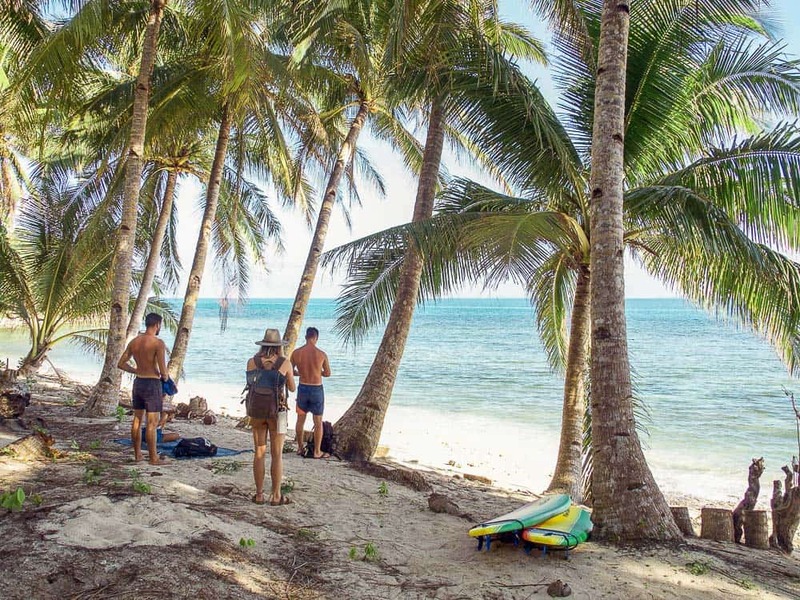 Exploring Guyam island was one of my favourite things to do in Siargao! 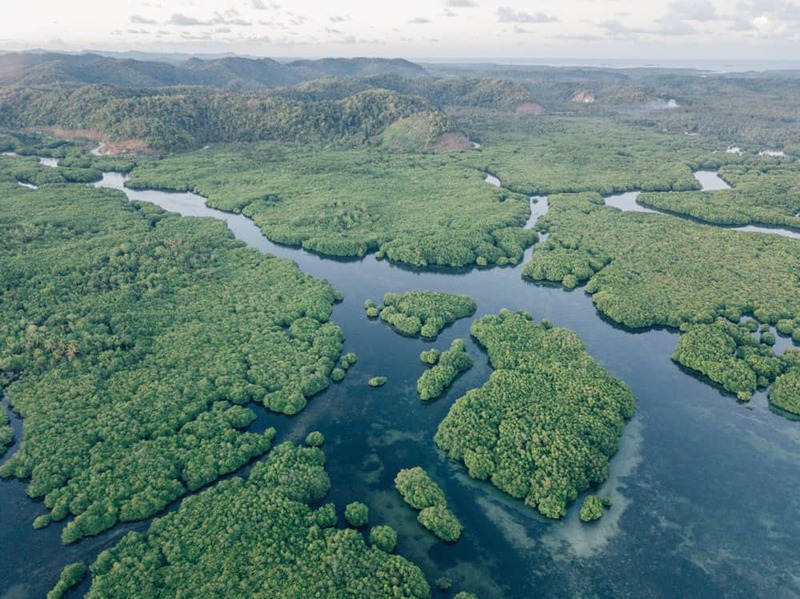 A day trip to Sugba Lagoon was one of the top highlights during my 2-weeks in Siargao and it is clear why I have added it to the list of 15 things to do in Siargao. 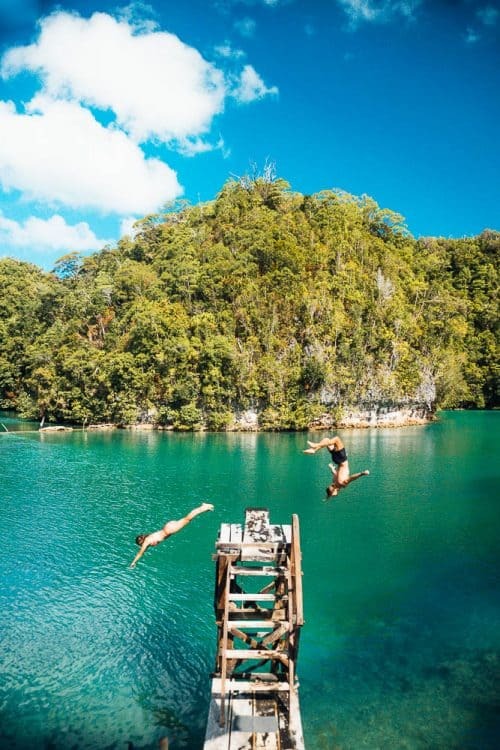 The Sugba Lagoon is a popular Siargao tourist spots that offers an unforgettable experience at one of the bluest lagoons I have ever seen! The cheaper option, the way my friends and I went, is to find your own way from General Luna to Del Carmen on a scooter. 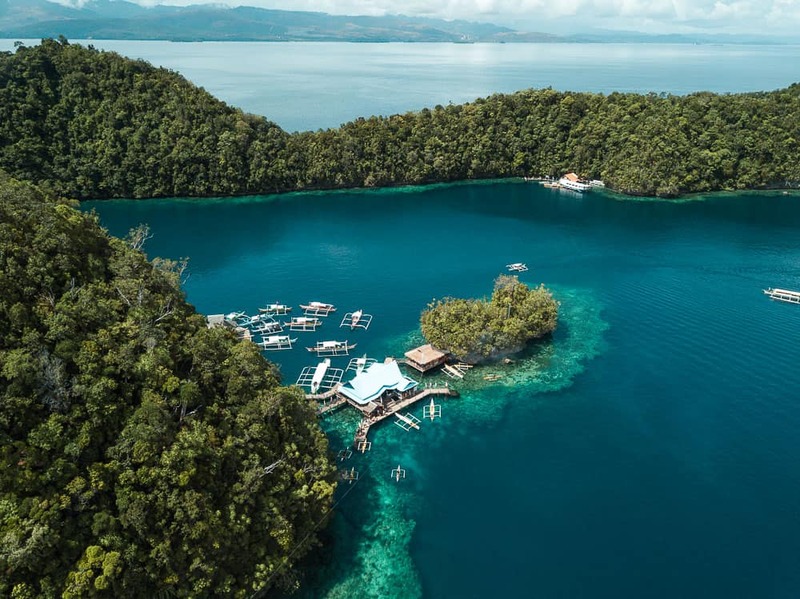 When you arrive at the Del Carmen pier there is a ticket office with a set price of 1500 pesos for the entrance fee and the boat transfer to Sugba Lagoon. The boat can fit up to six passengers, meaning you can split the cost of the boat. My best advice would be to gather some people in General Luna to join you in advance or alternatively, head to the Del Carmen pier and find a group of people with a spare spot on their boat. 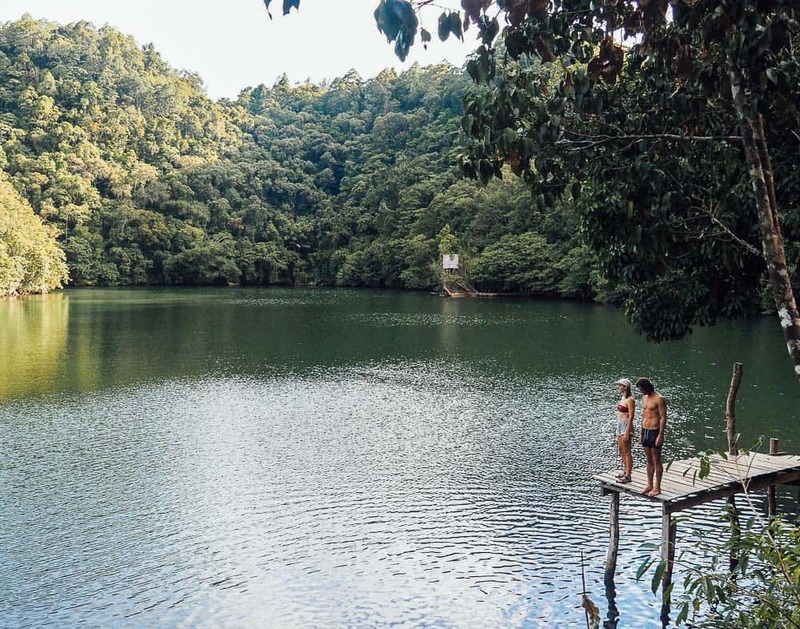 The first stop inside the Sohoton Nation Park is the Hagukan Cave. This cave was insanely epic, to say the least. To enter the Hagukan Cave we had to jump off the boat and dive down three meters, swim under a rock ledge and then swim up into the cave pool on the other side. I had to hold my breath for about 5-10 seconds and my guide led the way into the cave. Once inside it was quite dark and hard to see but then our guides told us to start splashing around and the water started glowing an electric blue colour. 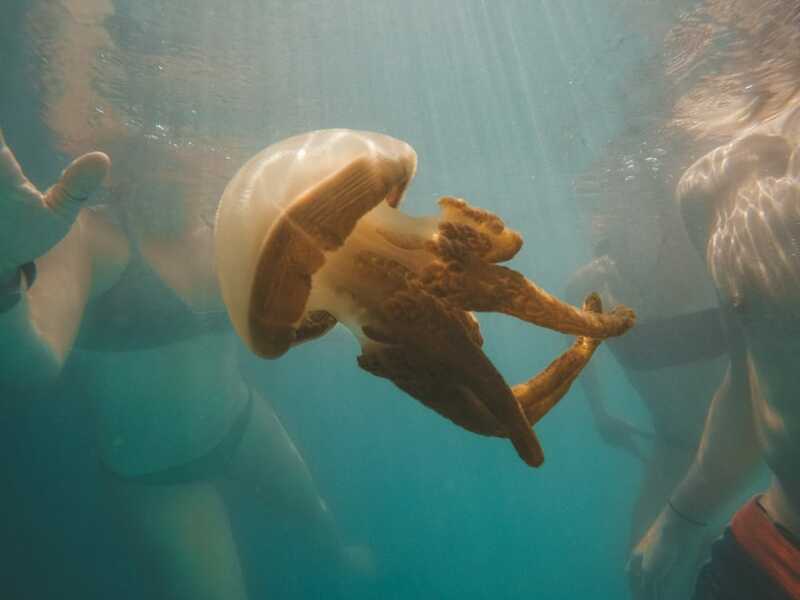 The next stop on the Sohoton Cave Siargao Itinerary was the Jellyfish Sanctuary. We were split up into pairs to jump on board a smaller wooden boat with a guide and they paddled us around the corner to the Jellyfish Sanctuary. When we arrived we jumped into the water and spotted dozens of little orange jellyfish bobbing around in the cove. They are safe to touch as they are non-stinging jellyfish. After the copious amounts of fun we had on the diving board we found a dirt trail that leads behind the resort and over a small ridge to Titikan Lake. It is definitely worth checking out as the hike to the lake only takes five minutes and it was the quietest and most peaceful spot we had discovered that day. 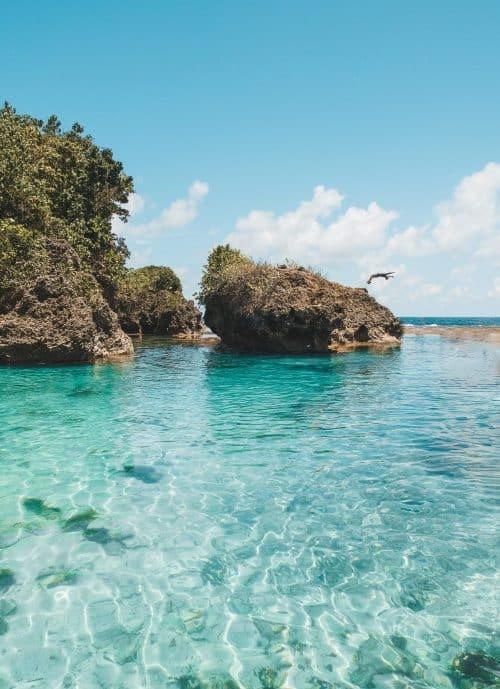 Corregidor Island, also known as Casolian Island, is a dreamy tropical island only 45-minutes by boat from Siargao. 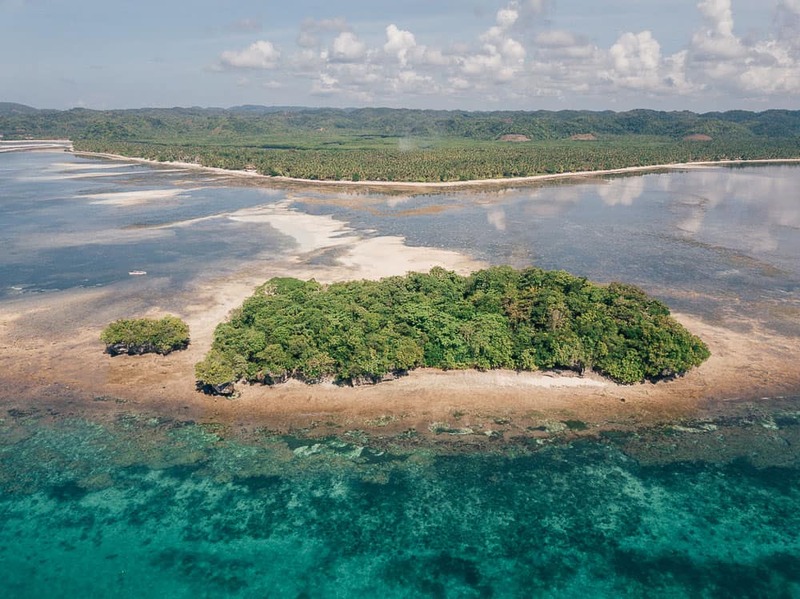 Make sure to add the Corregidor tour to the list of things to do in Siargao and explore the incredible landscapes and colourful coral reefs that this location has to offer. It’s a 10-minute easy trek from the main road down to the palm tree fringed shoreline at Guiwan Beach. 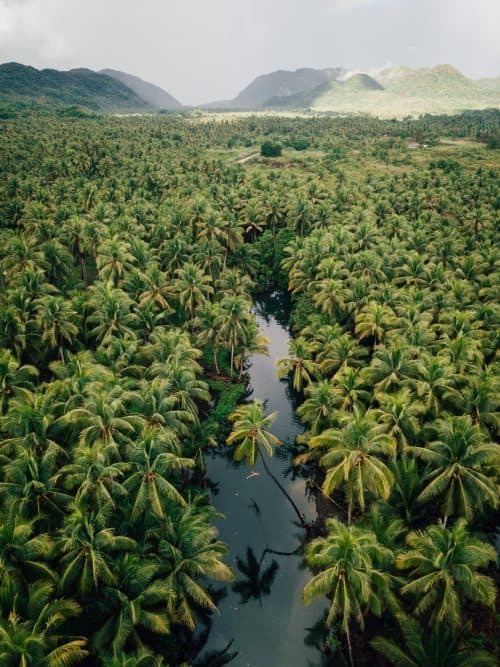 We parked our scooters on the side of the road and followed the dirt trail that threads between a forest of tall coconut palm trees, eventually ending at the beautiful Secret Beach Siargao. 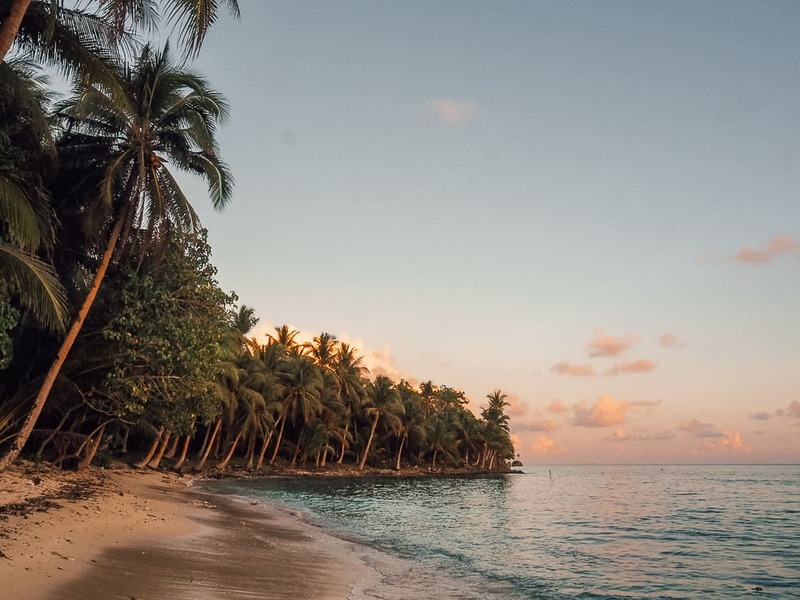 We spent a couple of hours at Secret Beach Siargao exploring the coastline, drinking coconuts and enjoying an unforgettable sunset over the horizon. 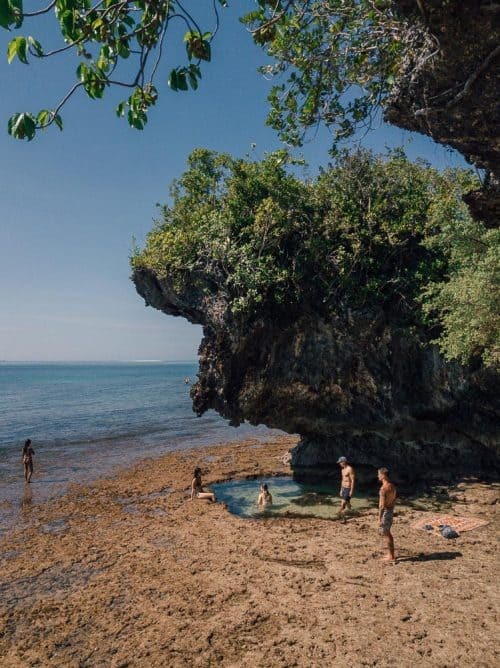 Doot Beach Siargao is one of my favourite chill spots on the island and a must-see spot on your Siargao Tour. 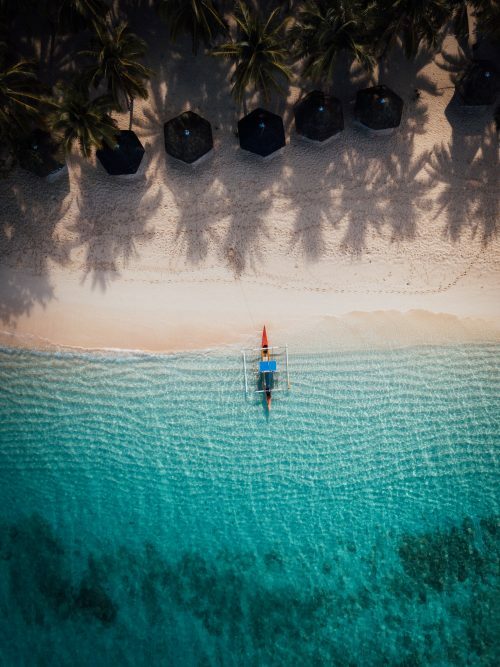 Doot Beach is one of the least touristy locations in Siargao Philippines, surprisingly only a 10-minute drive from the more popular Siargao tourist spot, General Luna. When we visited Doot Beach Siargao there happened to be a local Filipino taking a dip in the ocean next to his boat. We asked him if he would kindly take us over to the small canals between the mangroves and he happily did so. For a 30-minute boat ride, he only asked for 150 pesos. Doot Beach Siargao is best visited on high-tide and it is also an incredible location to watch the sunset on Siargao. 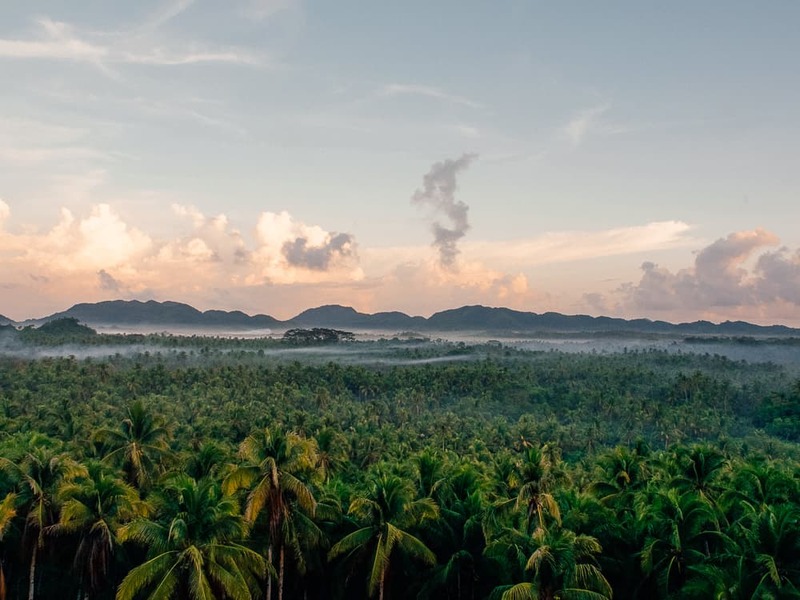 The sunrise viewpoint overlooking the Sea of Palms is a must-see location to add to your list of things to do in Siargao. 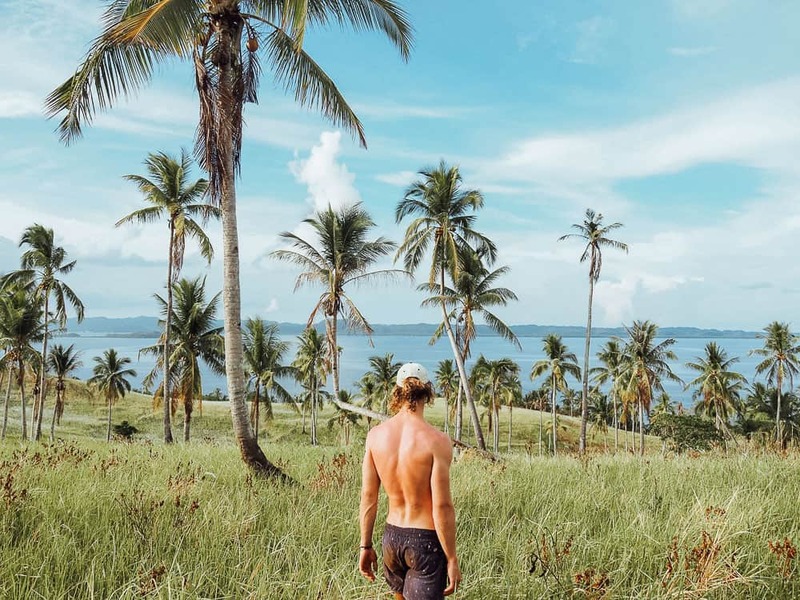 My friends and I stumbled across this incredible viewpoint as we made our way towards the Instafamous Palm Tree Road and the Palm Tree Rope Swing on Siargao Island. We were stopped in our tracks when we arrived at this insanely beautiful viewpoint to witness an unforgettable sunrise and foggy mist settling in over the Palm Tree Forest. The Sea of Palms sunrise viewpoint is approximately a 30-minute drive from General Luna in the direction of Pacifico Beach. 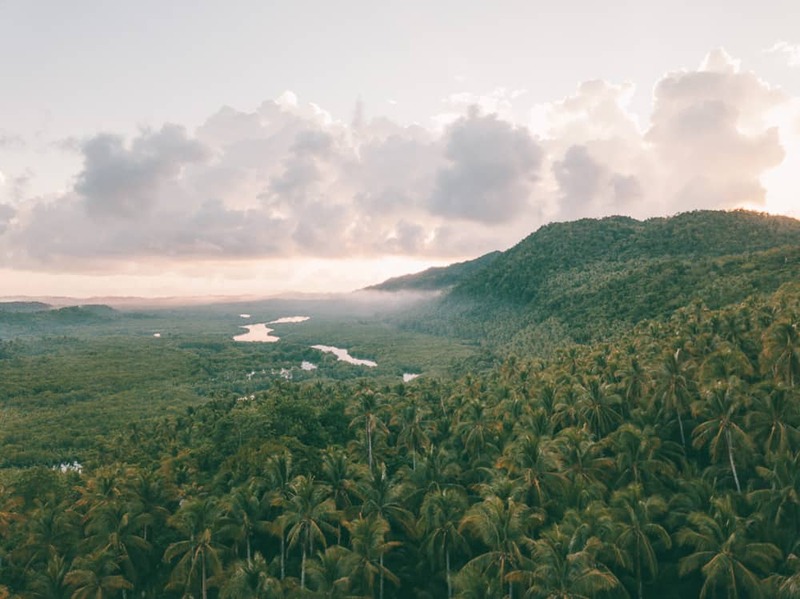 I guarantee you won’t miss it as you come around a sharp bend on the Siargao Circumferential Rd it opens up to this elevated viewpoint above the coconut palm tree forest. 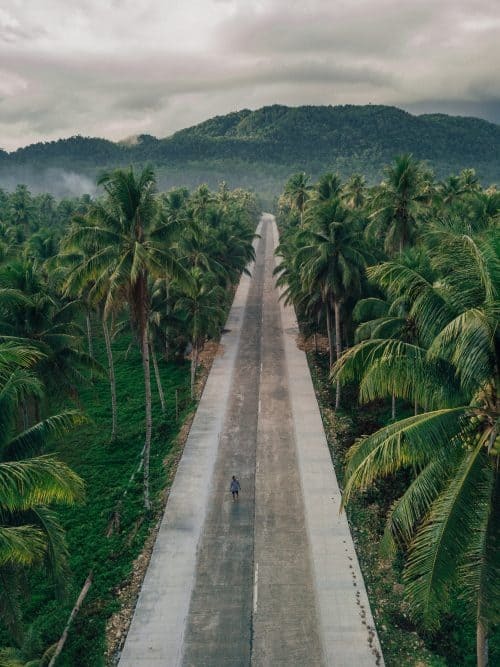 Siargao Island has countless amounts of palm tree lined roads but there is one road, in particular, that is Instafamous and makes for the ultimate photo. This spot is best shot with a Mavic Pro 2 Drone Camera to capture the surrounding landscape. 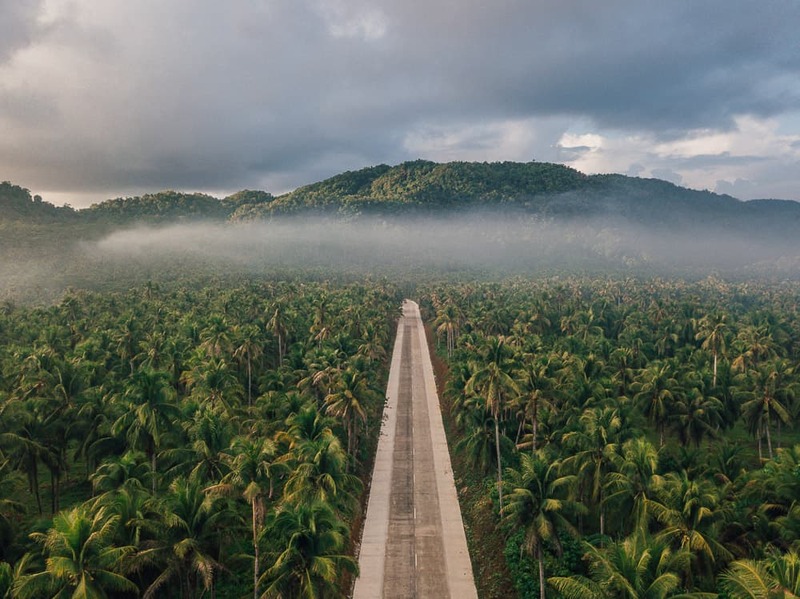 Regardless if you have a drone or not, the Palm Tree Road Siargao is still one of the most photogenic locations on the island and a definite addition to your list of things to do in Siargao. 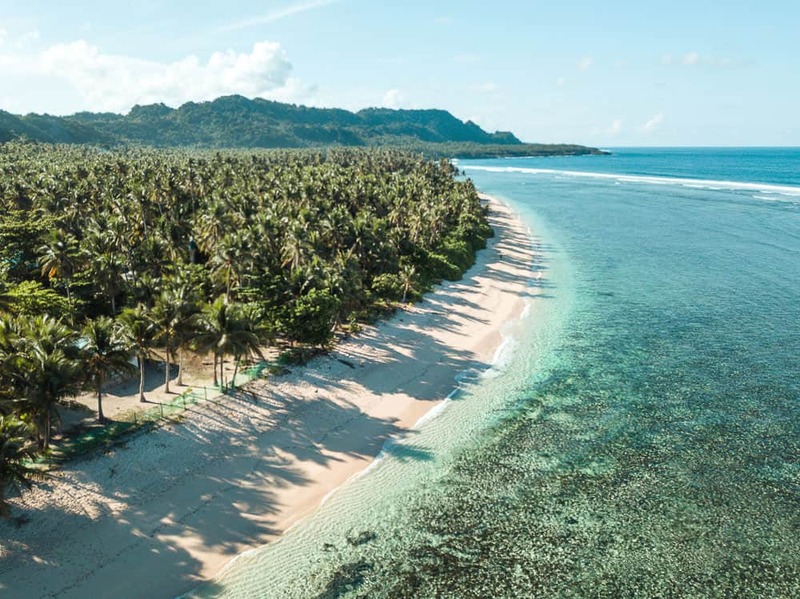 The Instafamous Palm Tree Road is located on the Siargao Circumferential Rd, 30-seconds down the road from the Palm Tree Forest Sunrise Viewpoint and approximately 2-minutes before the Bent Palm Tree Siargao. If you are heading here from General Luna, it is a 30-minute drive. 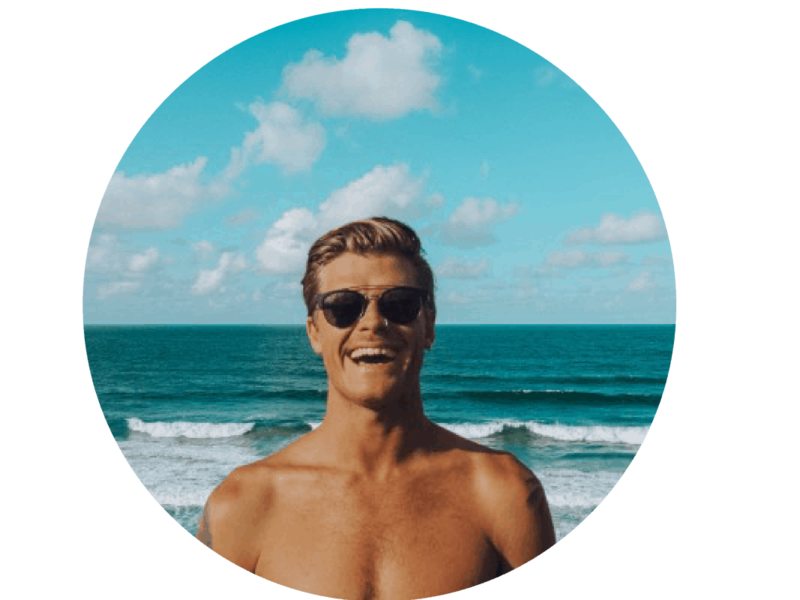 Santa Monica Pier is one of the best things to do in Siargao! Head north to watch the sunset at Santa Monica Pier as it is one of few worthy locations that faces west to be able to watch the sun drop behind the horizon overlooking the Dinigat Sound Ocean. 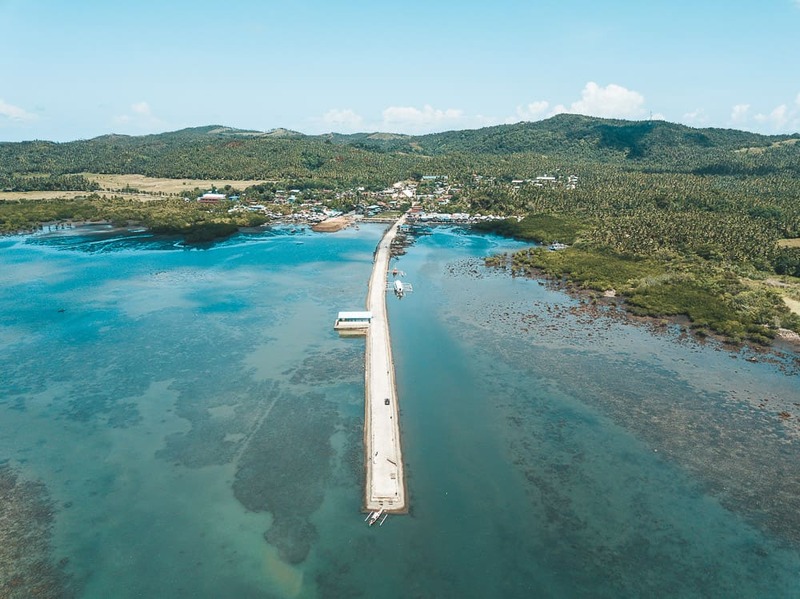 The Santa Monica Pier stretches approximately 500m out off-the Siargao mainland and it’s an awesome spot to send up the Mavic Pro 2 Drone Camera to get some aerial shots. 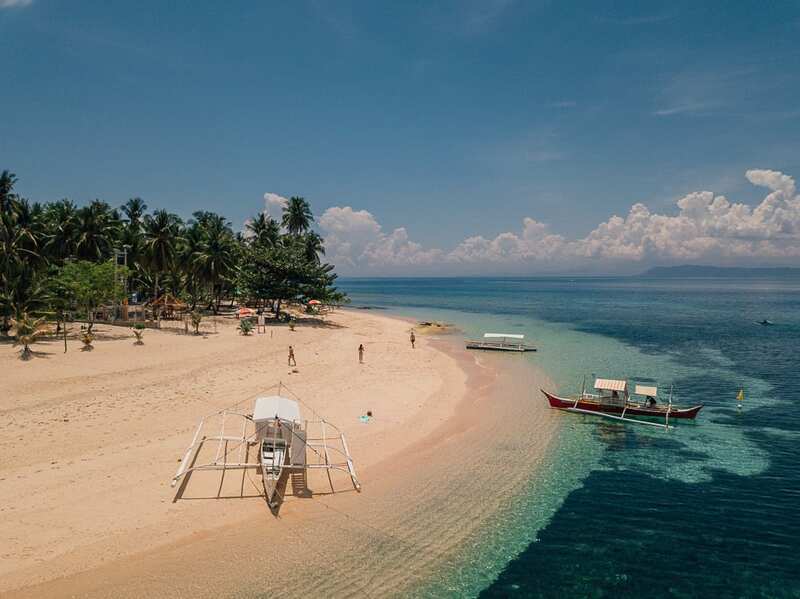 Santa Monica Pier is located on the north-west tip of Siargao Island. 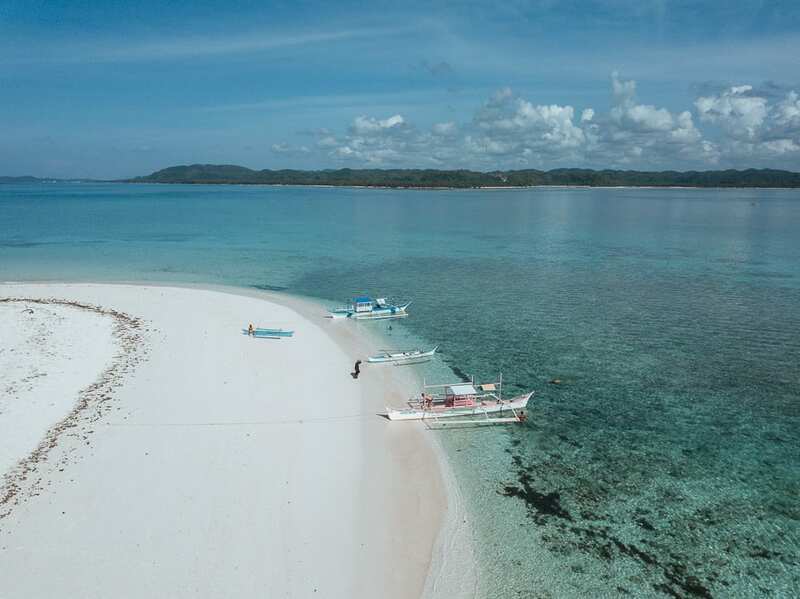 From the main Siargao tourist spot of General Luna, it is a 50km drive that takes around 1 hour 15 minutes. If you are heading to Santa Monica Pier from Pacifico Beach, it is a short 30-minute drive. For surfers visiting Siargao Island the best months for surfing is during the swell season which is August through to November. 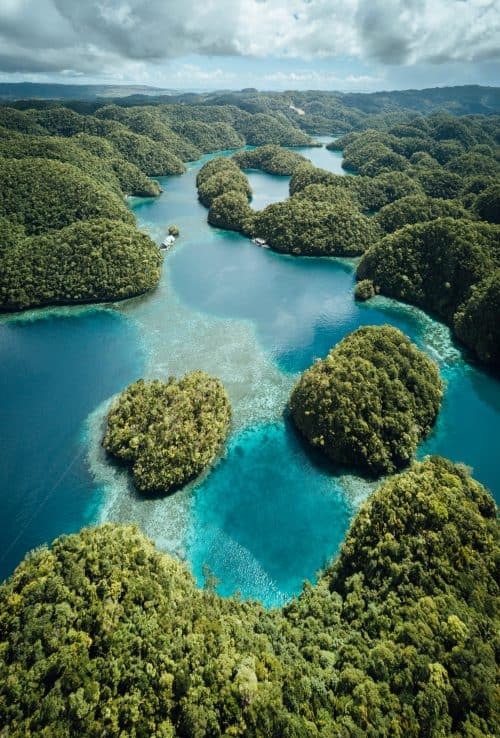 I hope this Siargao Travel Guide finds you well and if you have any questions about Siargao Philippines, please don’t hesitate to leave me a comment below and I will get back to you as soon as I can. Ahh this is so good! 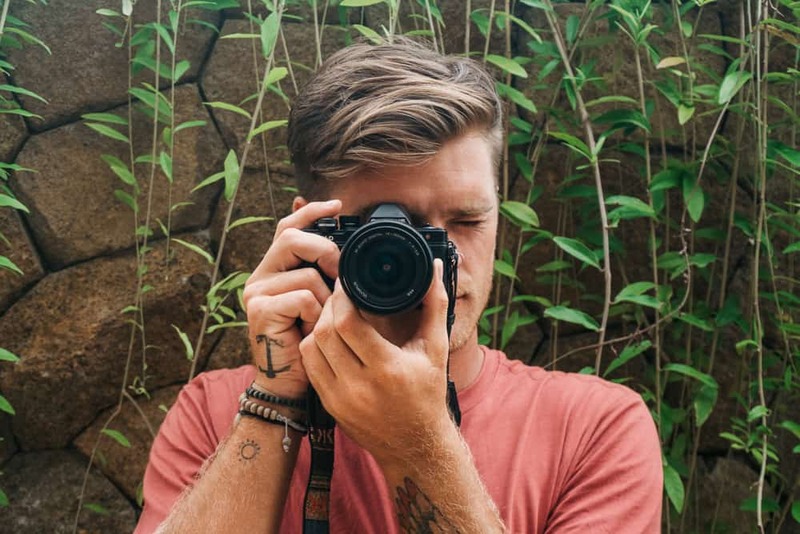 I went to Siargao a couple of years ago and did none of these things hah. And it was still the most incredible place I went to in the Philippines. Going back in a few weeks and can’t wait to knock a couple of these off this list when I’m there. Wicked post!